This smells the whole house up delicious! 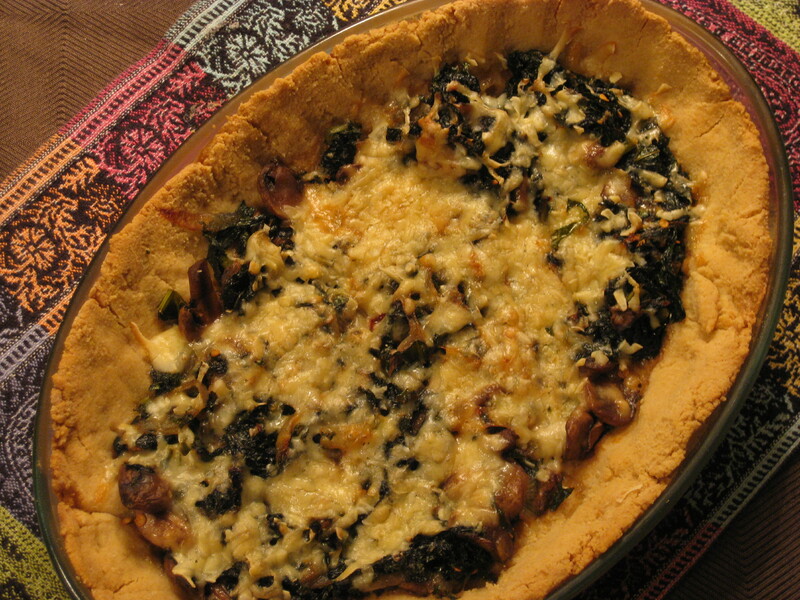 Serve with a soup or salad for a very filling meal. Put everything together in a saute pan on medium, except the cheese. Stir to coat veggies in oil and seasonings. Let wilt. Stir occasionally. Cook until onions are completely translucent. Cook off excess liquid. Mix all dough ingredients together very well. If your eggs are very large or have very large yolks, they may be moist enough to pull dough together without milk. Dough should be soft but hold a ball. 1. Press dough into pie plate or casserole dish. Bake 350 degrees F for 25-30 minutes until crust is golden and puffed up. If you can fight the pollen, get outside and cook! 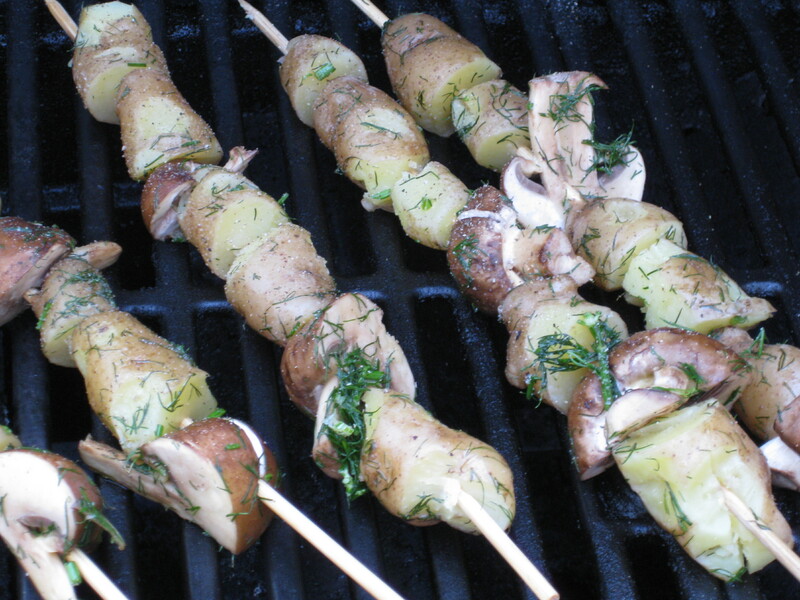 Veggies are more fun on a skewer. 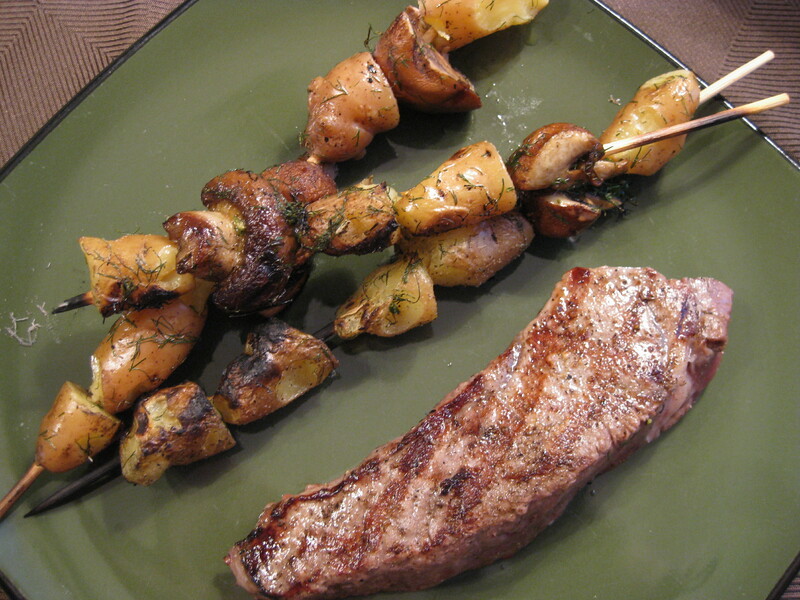 Try this simple side dish with your grass fed steaks. Parboil the potatoes to soften, about 7 minutes. They won’t grill very well unless they are mostly cooked. A knife should just go into them, not cause them to crumble apart. Drain them well and let cool. Toss mushrooms, potatoes, herbs, oil, salt, and pepper to coat well. Skewer on either metal kebab skewers or soaked wooden skewers. Grill 3 minutes on each side until tasty grill marks form. Handle carefully with tongs. Cooks Tip on Skewers: Soak wooden skewers 20+ minutes in cold water before adding food to them. This will reduce the chance they will catch on fire. However, they will still probably char significantly if you have flare-ups. Burning skewers tend to allow food to all through the grill. Not delicious.